Explanation: Two hundred and twenty light years from Earth, planets are forming. Recent observations of the binary star system HR 4796 have shown that one of the stars is surrounded by a dusty gaseous disk. This disk is of the right size, age, and density for dust pellets to accrete surrounding matter. A hole in the disk's center indicates that increasingly larger condensates are colliding and sticking together, coalescing into moons and planets. 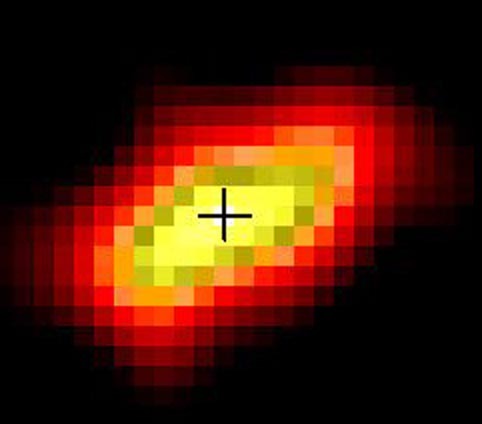 Pictured above is a false-color image of the system, with the bright star HR 4796A indicated by a cross. The disk measures about five times the size of our Solar System, and is seen nearly edge-on. HR 4796 is in the southern constellation Centaurus.